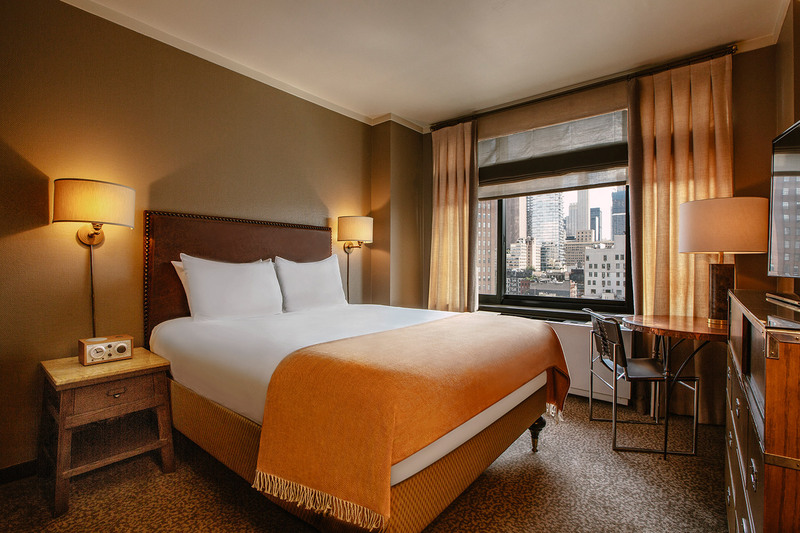 The 230 square foot Soho King Rooms, located on floors 3-7, features a custom king Englander mattress with leather headboard and hand-finished bronze detailing. With a solid walnut armoire with mirrored doors and a minibar cabinet crafted by Studio Sofield to echo weathered travel trunks, while other notable furnishings are a corseted leather Eileen Gray desk chair, custom copper-penny roundtables and marble-top nightstands. Original photography from Manhattan’s Golden Era graces earth-tone walls. The bathroom features white subway tile, a tub and New Yorker cartoonist Saul Steinberg-designed aviary wallpaper. ADA accessible rooms available upon request.